← TPA’s Summer Nights at Don The Beachcomber Begin! 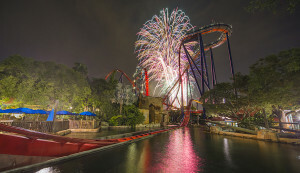 On Independence Day, Busch Gardens Tampa celebrates the red, white and blue all day, and even when the sun goes down, with thrill rides in the dark, live entertainment and an incredible fireworks show. Open until midnight, guests can celebrate the 4th of July festivities all night long. Challenge Florida’s top thrill rides, like North America’s tallest freestanding drop tower Falcon’s Fury or Florida’s first and only triple-launch coaster Cheetah Hunt. Plus, fireworks illuminate the sky at 9:30 p.m., with the best views in Gwazi Park right after the rock-fueled acrobatics show, Kinetix. Guests can enjoy Summer Nights at Busch Gardens from June 27 to August 16. Experience all the thrills this summer with an Annual Pass, which includes unlimited admission with no blockout dates, free parking, special deals and discounts, and much more! It’s the best value for Florida residents and it starts at just $13 per month with EZpay. For more information, visit buschgardenstampa.com. Or, be the first to know about new events, special deals and future announcements by following the park’s blog at BuschGardensTampaBlog.com, or “Like” the Busch Gardens Facebook page and follow @buschgardens on Twitter and Instagram. Fans can follow Theme Park Adventure via social media on Facebook, Instagram (search our posts with #TPA), Twitter, and Periscope for live streams of our travels and special events! This entry was posted in Home Page, Home Page Slider, News and tagged Busch Gardens Tampa. Bookmark the permalink.